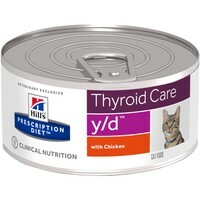 Hills Prescription Diet YD Thyroid Care Wet Food for Adult Cats is a nutritionally complete diet that is a safe, effective and easy way to manage thyroid health. Clinically proven to improve thyroid health within 3 weeks when fed as the sole source of nutrition, Hills Y/D has been made with lower iodine levels to keep your cat’s hormones at a normal level to reduce the symptoms of hyperthyroidism. Hills Y/D Thyroid Care also helps to support your cat’s kidney and urinary tract health thanks to controlled levels of phosphorus, sodium and magnesium. Iodine from other food sources (treats, another pet’s food, table scraps etc.) can compromise the effectiveness of restricted iodine nutrition. It is critical that you feed Hills Y/D as the sole source of nutrition.